All seniors (55 and older) are invited to enjoy a free meal, entertainment, and plenty of fun. Please bring a canned food item to be placed in the annual Christmas distribution baskets. 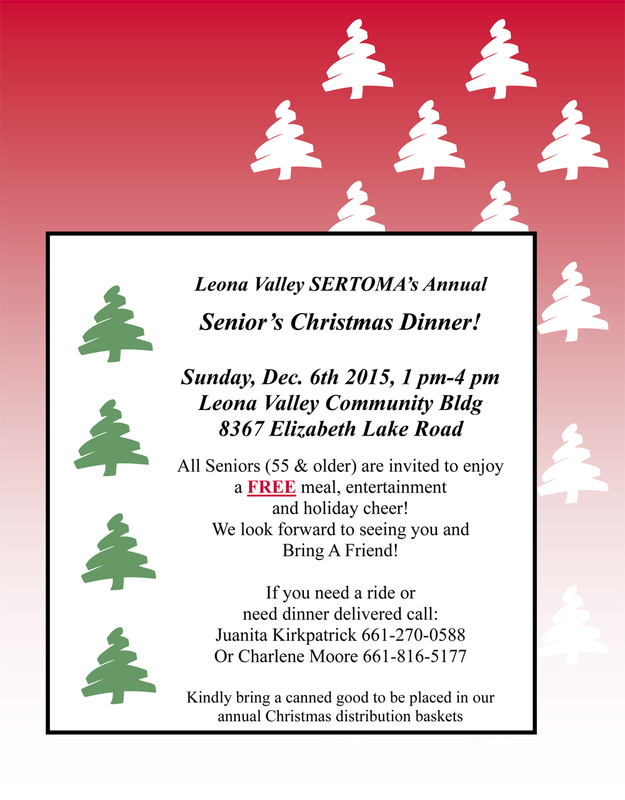 Leona Valley Sertoma would like to take this time to remind everyone of the upcoming Senior Christmas Dinner. This annual event is our chance to celebrate with the senior citizens in our communities and share food, gifts, and a good time; all in a social setting. The Senior Christmas Dinner has been hosted by the Leona Valley Sertoma since 2002, but it started with Lea Rackette and the local 4H Club long before there even was a Leona Valley Sertoma. This well attended event is a great opportunity for our local senior citizens to get out, visit, enjoy a meal and in general have a great time. It also offers opportunities for volunteers, young and old to get to know these incredible folks and learn more about the history of the area and what it was like for older generations. If you want to learn more about the upcoming Senior Christmas Dinner reach out to a member of the Leona Valley Sertoma. If you are a senior, or you know one, then you want to make sure and be at this event. It is sure to bring smiles and laughter in to your day. The flyer below has more information and contact info regarding this event.